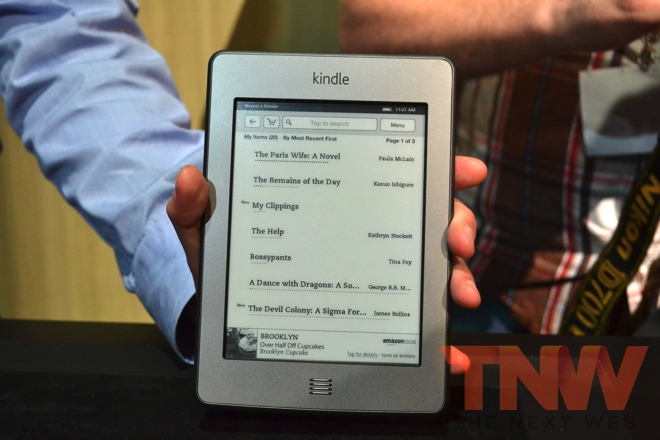 Amazon has today announced a new Kindle at its event in NYC. The device is called the Kindle touch and it has an e-ink IR touch display. There are no front facing buttons and it is smaller and lighter than the current kindle. X-Ray for Kindle is described as your English lit professor, like a mini Wikipedia for each book. It gets downloaded alongside every book and you can use it to look up information and definitions. 6″ diagonal e-ink pearl display with 600 x 800 pixel resolution at 167 ppi, 16-level grayscale. The Kindle touch device will run $99 with special offers and $139 without offers. The 3G model will run $149 with free 3G service and special offers and $189 without offers. Both models will have a higher-priced alternative without the offers. They will be available on November 21st and you can pre-order them here now. Read next: Amazon introduces Silk, its new "split" mobile web browser. Half on device and half in Amazon cloud.